The Mobile World Congress, the largest mobile event in the world, takes place again in Barcelona from the 25th till 28th of February, bringing together the latest innovations and technologies of the industry. We are pleased to announce that among the more than 2.400 attending leading companies from around the world, Signaturit will be once again one of them, more specifically from the Spanish Pavilion. If you would like to know more about the event and our participation then keep reading! The Mobile World Congress is held again at the end of February bringing together professionals from different technology industries to share, promote and advance intelligent connectivity. Technology enthusiasts can learn more about a variety of topics: connectivity, artificial intelligence, industry 4.0, immersive content, disruptive innovation, digital well-being, digital confidence and the future. In addition, during the 4 days of the event, different business models, regulations and the challenges of working in the new markets will be discussed. One of the main attractions of MWC is the interactive exhibition center known as GSMA Innovation City, which will offer visitors the chance to discover how mobile services will help create a better future thanks to artificial intelligence (AI). Visit Pavilion 4 if you want to be part of this unique experience and discover more about the future implementation of 5G technology, its impact on almost all aspects of our lives and the requirements necessary to make it a reality. As a novelty this year the organizers of the MWC, GSMA, present the "Digital Planet: The Connected Experience" in Hall 8.1, an evolution of the App Planet initiative that was introduced in the MWC since 2010. Digital Planet will include more than 200 applications, ad technology, e-commerce or marketing communication solution providers that focus on creating connected experiences and solutions that will positively impact citizens' daily lives. Participating companies in Digital Planet are amongst others, Infobip, who offers a communication platform for businesses and car brand Toyota. More than 107.000 key decision-makers from over 200 different countries are expected to attend the Mobile World Congress this year. One of the main reasons why going to the MWC is the possibility of listening to inspiring speakers such as Anjali Sud, CEO of Vimeo, the well-known website where users can upload, share and watch videos, or Mats Granryd, General Director of GSMA. In addition, for the third year in a row, the Woman4Tech program will be held, which will focus in this edition on the success of the industry thanks to gender diversity. This initiative focuses on highlighting the added value that plurality brings to a corporate culture, improving the performance of organizations and the lives of the communities where they operate. 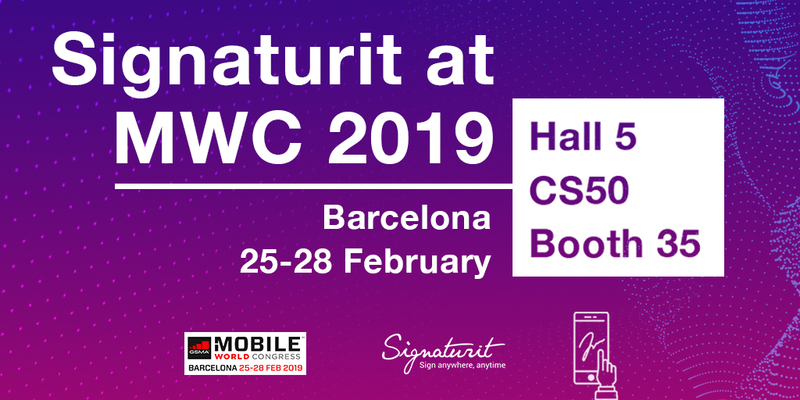 Signaturit will exhibit at the Mobile World Congress within the Spanish Pavillion, located in Hall 5 Congress Square Stand CS50 Stand (number 35). 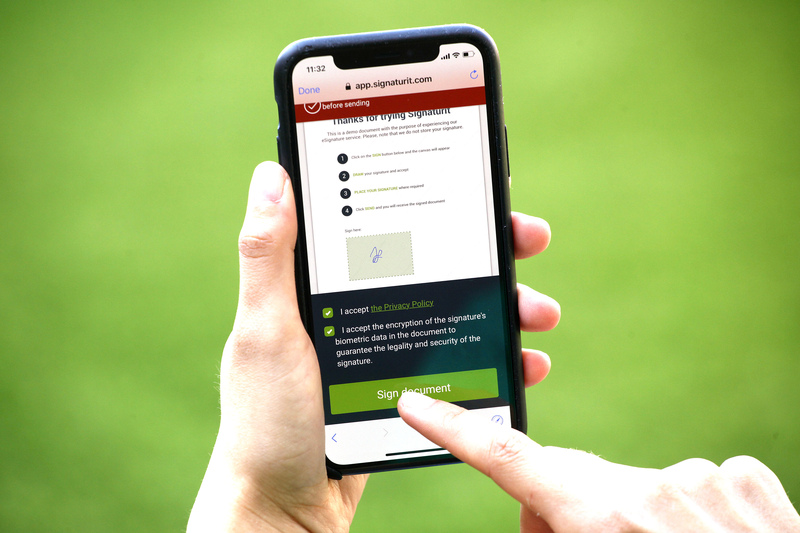 We will be delighted to explain to the attendees of the Mobile World Congress who are visiting our booth, all about the electronic trust services we offer (Electronic Signature, Certified Electronic Delivery and Electronic Identification) and how they help to automate processes, speed up the closing of contracts and maximize the ROI of digitization. In addition, we will inform all interested parties about our latest blockchain and machine learning solutions, thanks to which we can operate as a single reliable qualified trust service provider in the full flow of document management work (360°). Invitation: Visit us at booth 35, at the Spanish Pavilion. In a few weeks from now the Mobile World Congress will kick-off and we would like to invite you to visit our booth, and although spontaneous visits are always welcome, if you wish to set a specific date and time, do not hesitate to book an appointment here.